This camera is just so damn pretty. And it takes some pretty awesome photos too, what’s not to love? Seriously though, I sold my DSLR to buy myself this and I have no regrets. Yes, my canon might have had better picture quality (only slightly in my opinion) but what use was that when I barely used it cos it was so big and bulky? The Olympus Pen is the bloggers camera, so many of us have it and it’s easy to see why. Brilliant photo quality, pretty good video quality as well and seriously, look how pretty! If you don’t already own it, get it on your wish list now! If you happen to already have the Olympus, get yourself this lens. I’m getting this for Christmas from Ed and I cannot wait after seeing so many amazing reviews. Takes the pen that one step further to beautiful photos! 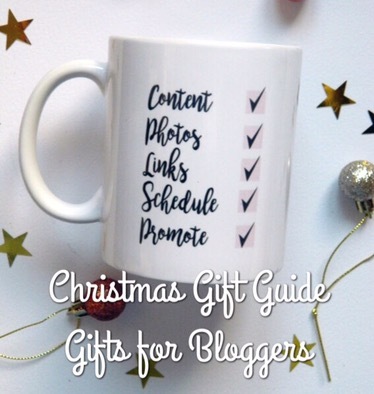 What to get the blogger who has everything? A pretty slogan sign for their wall! This one is gorgeous! Feeling you need to up your blogging game in 2017? Get yourself a planner to keep track of everything and write down your goals. This one looks brilliant. I actually got this last year and I love it. As I mentioned, I don’t drink hot drinks but I’ve used it as a prop in photos before so who cares?! This is an essential for anyone who, like me, is constantly writing notes, blog posts, transferring photos from their camera and staying on top of social media. Being a blogger drains your phone battery. This is the solution! I love this tee. They have lots of other options on the website but this is probably my fave. Perfect for that Instagram shot! I love quirky gifts like this and it could be re-used for a backdrop photo. I would suggest buying a chalk pen rather than trying to write with chalk, not as easy as it sounds! I would love somebody to come along and redesign my blog for me as I find it so difficult. This is the perfect gift for anyone in the same situation. So great that they offer gift vouchers! Lol I would love to get those mugs or first print. It sort of defines my life when a new month comes along!